An adaptation of the game "Diplomacy" for TripleA. This is as close as TripleA lets us come to the real Diplomacy board game. Uses some complex rules, be sure to read the game notes. 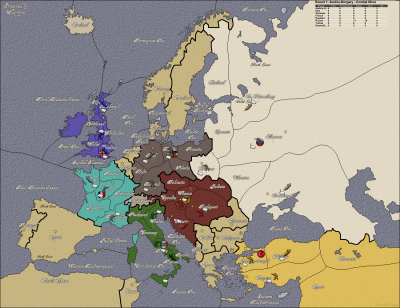 This is the Diplomacy map of Europe, with ww2v3 units and rules. Easy to learn. This is the Diplomacy map of Europe, with "Great War" units. Also very easy to learn. Unlike the other 3, this is a normal non-ffa game. It pits Germany, Austria, and Turkey, against France, England, and Russia. (Italy is neutral) It uses Diplomacy style units, Armies and Navies, with 3 territory types: Land, Sea, and Coastal. Be sure to download some of the map skins for this game.